The idea of simplifying the golf game by using clubs of equal shaft lengths and applying a unified swing technique led to the isolation of the pendulum dynamics from the active body rotation. Both elements of movement stand in relation to one another. The golf swing is composed of numerous partial movements. The pendulum motion approach during the backswing and the follow through, triggered and steered through an “up and down“ movement of the shoulder. for unified geometric conditions of the swing movement. These clubs also fit to the CARVINGGOLF “super” technique. 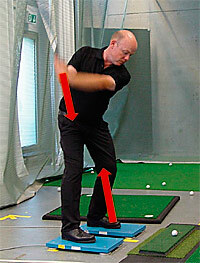 The core element of the golf swing is the physical pendulum (ref. Grosser 2001). On the basis of this fundamental principal, Dr. Ferdinand Tusker and Florian Kreuzpaintner have developed a sport science training concept and in collaboration with Thomas Thöni – PGA 1 star professional – have defined its possible and practical use in a textbook. Up to now, CARVINGGOLF has rested upon three pillars: muscular tension, clubs having equal shaft lengths and a new technique called the CARVINGGOLF technique. Eichenrieds pro Barry Rixom, shows the standing position, starting the swing, back swing and down swing, point of contact and follow-through of CARVINGGOLF. Prof. Dr. Manfred Grosser, the inventor of the “Universal Golf Learning System (UGLS)“, was the first to recognize the meaning of the HIPTURNER. By using this learning tool, the pupil can, through the use of peripheral vision, learn more rapidly and with less difficulty to turn correctly into the swing. 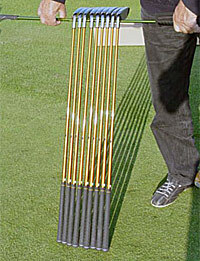 The HIPTURNER is a much used learning tool at the Golf Academy within the Hartl Golf Resort at Bad Griesbach, Germany . Pro Sebastian Lahmer, assistant manager of the golf school within the Hartl Golf Resort at Bad Griesbach, demonstrates the HIPTURNER. The French word for foot sole means: the dynamo-metric map of equilibrium. A very fitting definition. Insoles, which encourage the front part of the foot to revive its natural function of support and movement could prove to be a real winner. A faster and more open lead – into the game of golf for all? ONCE UPON A TIME, THE YIP AND OTHER CHIPPING PROBLEMS EXISTED! A secure grip, especially when the hands are wet! when the hands are wet! Which golfer doesn’t have problems with his swing when it begins to rain and the grip of the club gets wetter and wetter? The towel, used to dry the hands and the grip, soakes up more and more moisture and at the same time the rain glove totally gives up its capability to keep the hands dry. At this time, frustration reaches its peak. The club slides in the hand, is loose, and the swing is shot! The secret of the “Magic Net Glove“ lies in its net structure, made of synthetic material. The fibres of the net press lightly upon the surface of the grip and skin, there where the player develops grip pressure. The surfaces that are pressed upon each other remain immovable, the moisture draining through the mesh. The 27th annual conference of the international society for biomechanics in the sports (ISBS) took place in Limerick from August 17th to August 21st. It was the first time that the Carving golf swing technique was introduced to an international, scientific audience. ... The Spa on the basis of „ayuropa GolfSpa“ is a very meaningful and important partner and training assistant for Carvinggolf. erweitern, vertiefen und noch viel mehr. Es ist nie zu spät etwas „NEUES“ dazu zu lernen. The Benetton golf course, the time chosen and the outer frame of the course could not have fit better to this years seminar topic: SWINGING NATURALLY WITHOUT EFFORT with the Carvinggolf technique. Sie beginnt im ersten Schritt mit einem Vortrag am Lehrstuhl für Biomechanik der Fakultät für Sportwissenschaften der Technischen Universität München (TUM) mit dem Thema „Biomechanik des Golfschwungs“. Hier erfährt der Interessent die theoretischen Inhalte der Carvinggolf Technik und die Unterschiede zur klassischen Technik. Er kann nun entscheiden, ob eine Ausbildung zum Carvinggolf Instruktor für seine beruflichen Ziele sinnvoll ist. Auf Initiative der German Golf Teachers Federation (GGTF) hielt im Rahmen eines Seminars Dr. Ferdinand Tusker (akademischer Oberrat am Lehrstuhl für Biomechanik im Sport) am 4.11.2007 einen Vortrag mit dem Thema „Biomechanik des Golfschwungs/ Translation und Rotation.“ ... Zum Abschluss diskutierten die Seminarteilnehmer mit Dr. Tusker über Carvinggolf aus der Sicht der Biomechanik und mit Jürgen Bechler aus der Sicht der Lehrmethodik. Die Ergebnisse überraschten Trainer wie Sportwissenschaftler. Die Teilnehmer der Carvinggolf Gruppe waren deutlich früher spielfähig und verblüffend treffsicherer als die andere Gruppe und waren erstaunt, wie "einfach" Golf sein kann. Carving Golf setzt mit den Iron Golf Turnieren neue Maßstäbe. Die Wettspiele werden ausschließlich mit Eisenschlägern ausgetragen. Natürlich kann jeder Teilnehmer seine eigenen Eisen spielen, von Vorteil sind allerdings Carving Golf Schläger, die Eisen mit gleichen Schaftlängen. Einheitlicher Schwung, einheitliche Schwungebene erleichtern das Spielen bedeutend. Die Carvinggolf School hat in Zusammenarbeit mit der Fakultät für Sportwissenschaft der Technischen Universität München einen Feldversuch durchgeführt, bei dem in einer Gruppe die klassische Golftechnik gelehrt wurde und in der anderen Gruppe die Carvinggolf Technik. Als Carvinggolf Partner-Platz können Sie Ihr Angebot qualitativ erweitern und attraktiv ergänzen. Dynamisches Unternehmen, das sich nicht auf dem „Heute“ ausruht, sondern bereits an „Morgen“ denkt.  Die Aktivitäten bei der Carving Golf Technik werden auf die Bewegungen beschränkt, die notwendig sind, um das Arm-Schläger-Pendel auf seiner Schwungbahn zu halten. Since 27.02.2007 more Initial Results! The measured results show that the Carving GolfTM technique, whose foundation is based on the dynamics of the pendulum motion, is practically identical in terms of clubhead speed to the classical golf swing, in spite of its reduced take-a-way to parallel at shoulder height. Das Set "RETRO" überzeugt durch moderne Technik nach traditionellen Maßstäben. 4 Eisen auf der Basis gleichlanger Schäfte - sind der traditionellen Terminologie angepasst. Henry Cotton hat in den 40ern mehrmals die British Open und über 30 PGA Turniere mit single-length golf clubs gewonnen. Carvinggolfer spielen seit 2002 mit single-length golf clubs (!) und jetzt gibt es einen Hersteller von single-length golf clubs auch in den USA.